It is not always easy to know where some local election candidates stand on the issues, particularly those relating to county and city employees. For example: How will they handle budget shortfalls? 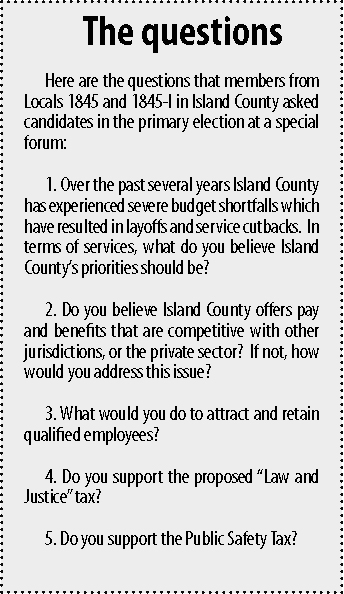 In an effort to learn more on their candidates’ stands, a group of members from locals 1845 and 1845-I in Island County invited the nine candidates standing in districts 1 and 2 in the August primary election to meet with them and to answer five questions on issues relating to the election. 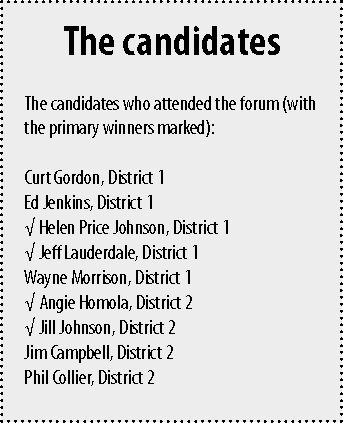 All nine candidates agreed to attend. Among them were the two incumbents who were standing again. The candidates’ forum was held July 17 in the Coupeville Recreational Hall. About 50 members attended. With the candidates waiting outside, Staff Representative Vinnie O’Connor explained the purpose of the meeting to the members. “We then brought the candidates in one by one,” explains Kyla Walters, of Local 1845, one of the organizers of the meeting. O’Connor asked each the same five questions that had been prepared by the locals in advance (see list alongside). “The meeting was helpful in letting us know what the candidates stand for and what we can expect from them,” she adds. Walters adds that most members who attended the forum and to whom she talked were happy with the results of the primary election. “Those who won were those who some of us thought were the best, based on their answers to the questions at the forum,” she said. The members will decide whether to hold another forum before the November election or whether they have sufficient information on which to decide whom they will support. “Generally, everybody thought it was a positive experience,” Walters adds.